As always, slight spoilers for the previous novels. Coming fresh from reading Heir of Fire, Queen of Shadows lacked a little bit of the punch that the other did. Perhaps it was because she was back in Adarlan where I was already familiar with the villain, but I felt that this book dealt with a lot of the logistics of setting up the next book in the series and dealing with the aftermath of what happened in Heir of Fire instead of really doing anything new. For me, Celaena’s journey back to Adarlan and the duties she had to address there were a little boring after the excitement of her training and coming into her identity as Aelin, as well as the excitement and horror at the capture of Aedion, Dorian, and Chaol. In Queen of Shadows, not only does Aelin have to address her past, but she also has to address the future of her kingdom as well as the continuation of the one she’s known for half her life. And unfortunately, a lot of that was planning and plotting. In the last book, Celaena’s character growth was something that I truly enjoyed reading and that growth is not quite done. Yes, she came into her power and name, but there are moments in Queen of Shadows where Aelin can’t quite shake her identity as Celaena. She’s been Celaena for half her life to survive, so getting rid of that persona completely is likely impossible. There are skills and allies she made while she was an assassin and she finds that it is necessary to masquerade as Celaena for a few moments longer. This time, however, I liked reading how that caused conflict within her, as well as shock for the characters around her. The characters who only knew her as Aelin sometimes struggle with her actions as Celaena, while the characters who knew her as Celaena struggle with seeing her as anything else and don’t always trust her actions as Aelin. That leads to conflict between all the characters involved, which was a source of a lot of the tension in the book. This book really focused on the internal tension. As always, there’s the outside tension that comes from their enemies and their movements, but this one really focused on the tensions between characters and their allies. They didn’t always trust each other even if they all were working toward a greater goal. Aelin no longer can rely on the magic that she’d nurtured because she’s back in a land where it was cutoff. She can’t rely on the fear tactic of showing her power, although she does still have the fear tactics of an assassin. Instead, she has to rely on her words and her diplomatic skills. It was a nice change because she had to come into her other power: that of a Queen. As Queen, she can’t just force her potential allies to their knees. She has to address their concerns as well as her own, and come to a decision, which could often be a compromise. This was shown through her interactions with Chaol. When she left and he discovered that she was Aelin through the hints she gave him, he really struggled with coming to terms with that information. The girl he thought he knew was someone completely different. He wanted to ignore that she was an assassin, but he couldn’t ignore that she is the lost Queen. He also has to deal with the heartbreak that he still feels about losing her and being unable to love all of the different parts of her character. Aelin, likewise, hasn’t quite dealt with how their relationship ended. They both have anger in them, and that makes it nearly impossible for them to compromise. Until they’re able to forgive the things that have happened between them–and the decisions that they both make to protect what they love but doesn’t necessarily protect what the other loves–they don’t work well together. Chaol wants to protect his kingdom, and Aelin wants to protect hers. I thought that Maas did a wonderful job at showing the pressures of being the sole heir of a kingdom but she also wants to be a girl, a friend, and a person. But so much of Aelin’s identity now is the fact that she’s that heir, and it definitely gets to Aelin. She has to step into her role as a Queen and the leader of her Court, and sometimes she doesn’t quite fit. Her journey to fit into that mold yet still remain true to her friends, her Court, and herself was plotted out really well. It wasn’t instantaneous and she had to balance all those parts of herself. In the last book, Manon Blackbeak was introduced as an Ironteeth witch, a type of creature that had previously been shown as a villainous one. She’s in charge of the Thirteen, who are thirteen Ironteeth witches that are basically the best at what they do, and what they do varies. In Heir of Fire, her storyline wrapped up with the Ironteeth witch storyline was interesting but I wasn’t sure why it had been included. It seemed like it was just there to divide the narrative and to show more of the world without any real function. There’s more of a focus on that story in this novel and I ended up really liking her character. Her character arc was really well done, and reading her part was a welcome change from the kind of boring set-ups that were occurring in the Aelin, Chaol, and Adarlan storylines. She’s built up as a character who has these strict rules that she follows, but more and more she’s put into situations where she questions her upbringing as an Ironteeth witch. She questions if everything she’s known her whole life is as black and white as it seems. I honestly think that she’s my favorite character in Queen of Shadows because of that internal conflict. It’s the reason why I liked Celaena in the last novel so much; I love the internal conflict as characters come up against things they’ve avoided for a chunk of their lives. I’m really excited to see what happens with her and her Thirteen and if Manon will change. While I did really enjoy this story, particularly the Manon/Thirteen storyline, I did feel like it lacked some of that page turning excitement that the other had. 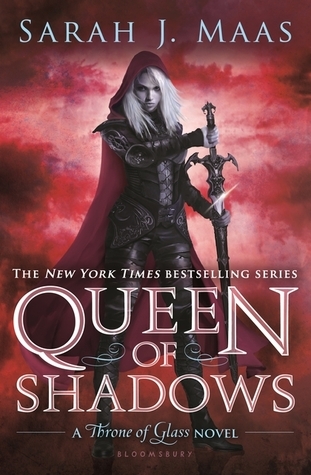 I felt that Queen of Shadows ended kind of abruptly, with several conflicts and storylines wrapping up a little too neatly for my tastes, even though there were consequences that will linger in the next book. While some parts of the book are definitely worth a 5 star rating, I didn’t have as many feelings of pure enjoyment that the previous novel gave me. Find me in the wilds of the internet! Top Ten Tuesday: Can I switch places?